Note: Sonde is currently in beta, there may still be bugs so please be sure to download and fully test your copy before purchasing. Sonde only works with some radiosondes used in the USA. Sonde is an app to decode radio transmissions from radiosondes (weather balloons). It is available for Windows (7, 8, and 10) as well as macOS 10.9.5 and later. It currently can decode LMS6 and Mark IIa style radiosondes. Support for other styles could be added, I would need high quality recordings of them for testing purposes. 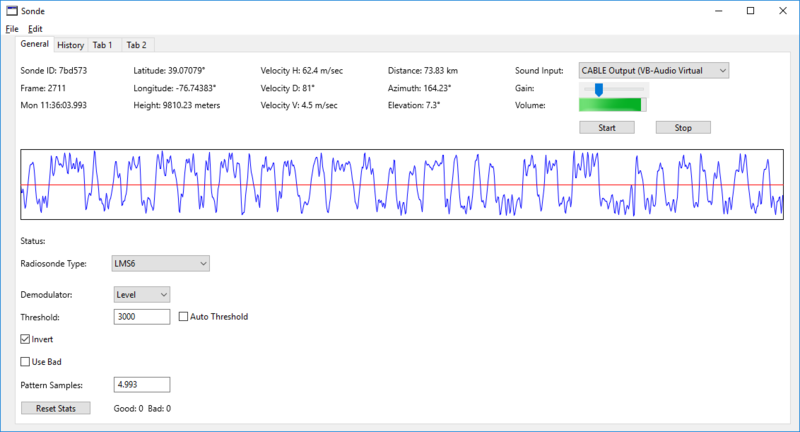 Sonde can decode live audio from a sound card input, as well as from WAVE recordings. The position (latitude, longitude, altitude) of each message received is displayed, along with some other information. Sensor readings are not displayed. This information be used to track the radiosondes in real time, and aid in their recovery.